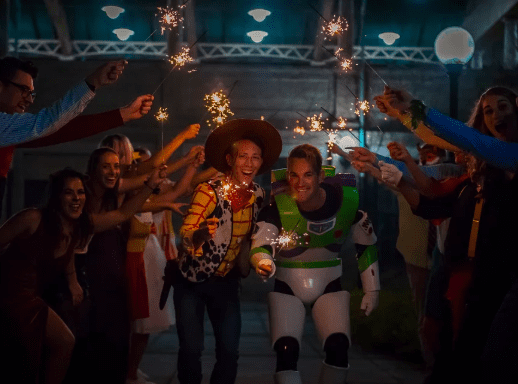 Garrett and Jason just pulled off their dream wedding: a Disney-themed nuptial to which guests came dressed as characters from their favorite Disney movie! Every single one of the guests, including their dog, dressed accordingly. 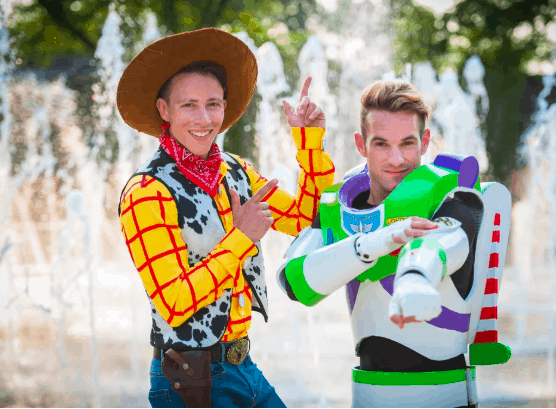 Some of the costumes were truly special, but the show was stolen by Garrett and Jason, who dressed like Woody and Buzz Lightyear from Toy Story. The couple met at a friend’s New Year’s Eve party, which they found out at the wedding was the same occasion Jason’s parents and grandparents met. What are the chances of that? Clearly, it was meant to be! The couple’s first dance was a choreographed Latin-jazz version of Randy Newman’s “You Got A Friend In Me,” the theme song to Toy Story. To perfect the Disney-themed wedding, Jason and Garrett designed the table decorations by hand, which Jason said was his favorite detail of the wedding. For the newer released movies that were not released to VHS, Jason designed the clamshells, especially for the occasion. But why Disney? It turns out Jason and Garrett were both Disney fans growing up. After they went on their first trip together to Disneyland, it grew into “an obsession,” as Jason describes it. The couple also loves dressing up and throws an elaborate Halloween party every year. They also enjoy cosplay at Comic-con. To signify the good, the bad, and everything else that comes with marriage, the pair “had a mixing of the mai tai.” This tiki drink cocktail is made from rum, Curaçao liqueur, orgeat syrup, and lime juice. The two are tiki drink enthusiasts and travel around the country, frequenting tiki bars.